Baking for other people gives me just as much joy (if not more) as eating what I've baked myself. My husband Andy is a video game programmer, and his company is working up against a big deadline, so I baked some treats for my him and our buddies there to get them through the long hours of the next week. I'm so excited about my new cookbook, the America's Test Kitchen Family Baking Book. I love ATK and their rigorous scientific approach to recipe testing. Whenever I make one of their recipes, I can count on knowing that it will come out perfectly. ATK does all the work and I get all the credit! When I bought this book last weekend, I tore into it right away and read it cover-to-cover in one sitting. I need to stop ignoring the signs that playing in the kitchen is quickly becoming an obsession. 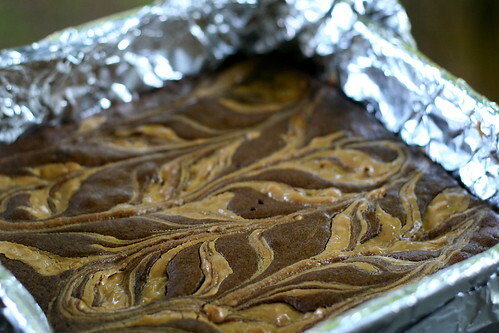 For my first ATK baking adventure, I chose one of their brownie recipes, adding in a peanut butter swirl. As predicted, perfection! This was my first time making brownies from scratch. It was also my first time making swirlies! If you make these, make sure you use unsweetened chocolate. Also, don't taste unsweetened chocolate on its own like I did. That stuff's nasty. I used chunky peanut butter, but smooth would work too. So would nutella or jam. 1. Place an oven rack in the middle position. 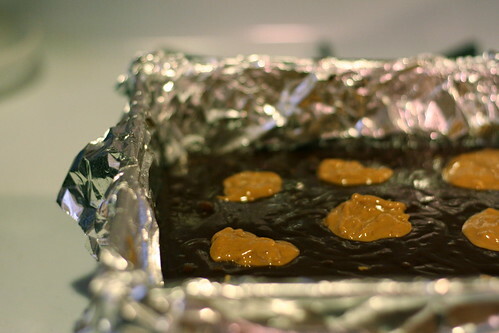 Preheat to 350 F. Line an 8-inch square baking pan with a foil sling (2 pieces of foil crossed over each other and smoothed down) and grease the foil. Melth the butter and chocolate together in the microwave, stirring often, 1-3 minutes. Let the mixture cool slightly. 2. In a small bowl, whisk together the flour, baking powder, and salt. In a medium bowl, whisk together the sugar, eggs, and vanilla. Whisk in the melted chocolate mixture until just combined. Stir in the flour mixture until just incorporated. 3. Scrape the batter into the prepared pan. Plop the peanut butter evenly around the top of the batter. Run a butter knife through the batter to create swirls. 4. 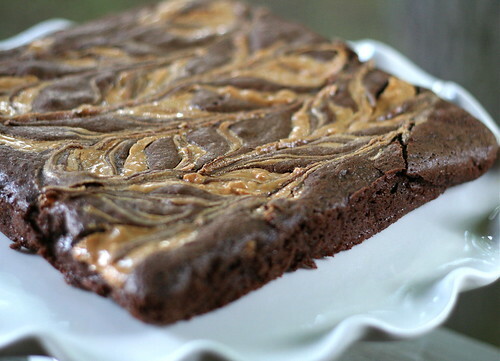 Bake brownies 22-27 minutes. Let cool completely on a wire rack, about 2 hours. 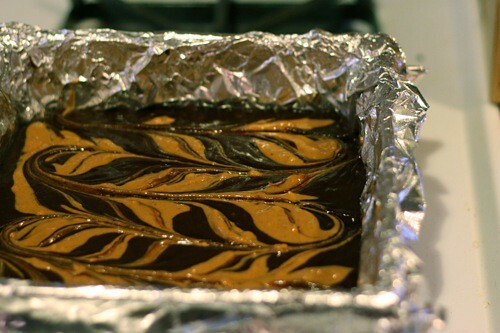 Remove from pan using the foil, cut into squares, and enjoy! those look delicious. i have been craving chocolate & pb lately, but lazily I've just been dunking the choc into the pb jar. Time to quit being lazy. yum! btw...definitely too beautiful to cover with frosting. Hot damn, those look good! Might have to make some of those for my videogame designer hubby! These sound absolutely delicious. Whenever Sara bakes something like this, I take it to my office immediately and allow the vultures to get their fill lest we gobble them all up ourselves. Dude! Those look amazing! 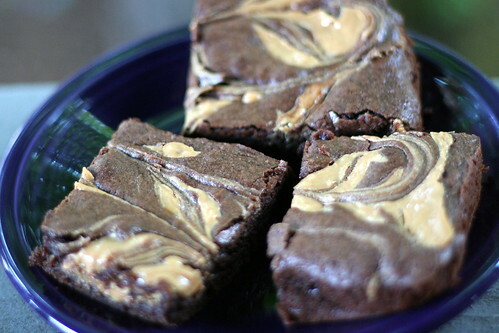 Brownies are soooo my favorite dessert and I am going to have to try to make theme from scratch one of these days! The peanut butter swirlies look like perfection. I can't imagine doing that on my own. I even had to take a few double takes at the picture after reading the directions. haha. You are so good! I made something for pipeworks today too. hahahaa. How funny. What a coincidence! I'll probably have Ryan taste it tonight to make sure it's good before I take it over there. I agree with your happiness cooking for others rather than making it for yourself. I have the same thing goin on. So awesome. Mmm these look so good! I'm english but my friend used to live in america and has got me addicted to american style food. I will end up burning the kitchen down but it'll (hopefully) be worth it! I added some Nutella to bring these to the next level! But great recipe!